(Newser) – Rescuers in Indonesia continue to search for two Japanese scuba divers missing since Friday, buoyed by the remarkable rescue of the other five members of the diving group today. 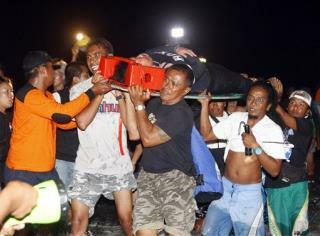 Fishing boats spotted the five women clinging to a coral reef off the coast of Bali, reports AFP. They had drifted about 12 miles in stormy weather from where they originally went in the water. All are expected to survive. It's a dangerous area in which to dive, but all seven in the group had plenty of experience, reports the Guardian. Lots of things went wrong with this one. Don't even want to start. Completely preventable. I hope they find the last two Japanese ladies.